Alleluia Ministries 'resurrection' suspects appear in court - SABC News - Breaking news, special reports, world, business, sport coverage of all South African current events. Africa's news leader. The case has been postponed to the 26th of April because the state wants to verify citizenship of the accused. The much publicised story of modern-day resurrection was back in the spotlight on Wednesday. The two people who’ve been arrested in connection with the purported resurrection of Brighton ‘Elliot’ Moyo were in court. 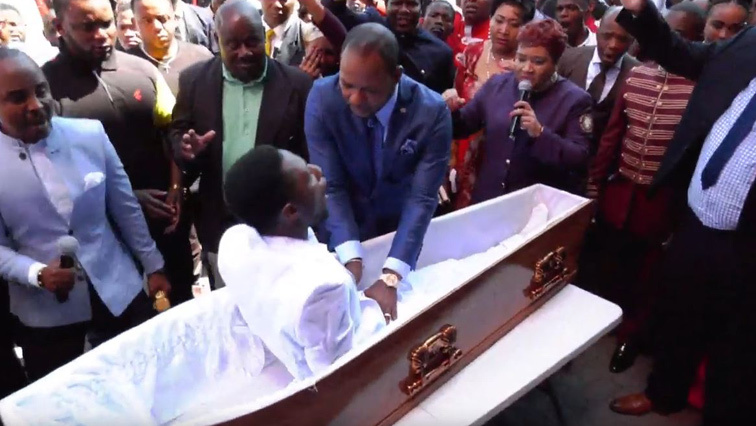 This after in February this year a video surfaced showing pastor Alph Lukau purportedly bringing a man back to life. It is believed the incident that took place at Lukau’s Alleluia Ministries International in Sandton. The case has been postponed to April 26 because the state wants to verify citizenship of the accused. The National Prosecuting Authority (NPA) says the accused are in possession of South African and Zimbabwean documents which contain conflicting information. The suspects are believed to be congregants at the church and face charges of fraud. The man being resurrected in the video, 29-year-old Moyo, reportedly died earlier this month in Zimbabwe. The NPA says more arrests are imminent. This entry was posted on 17 Apr 2019,06:41PM at 6:41 PM and is filed under South Africa, Homepage Latest Stories Slider. You can follow any responses to this entry through the RSS 2.0 feed. Both comments and pings are currently closed.